the best source of Organ music on the net. Organlive is a listener-supported internet audio station with a focus on music of the classical organ. We maintain a growing library of music that currently contains over 21,000 tracks. 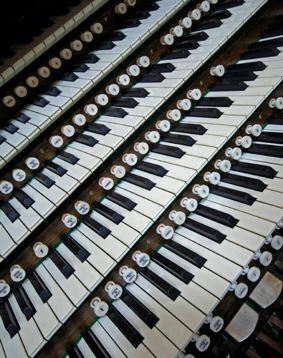 Our library features classical organ music performed on pipe, electronic, and combination instruments recorded all over the world. Follow a link above or below to begin exploring Organlive. Organlive is easier than ever to listen to. Just click the speaker icon above to tune in. Download our apps for Android, iPhone, iPad, and iPod touch. A broadband connection is required to tune into Organlive. Our audio stream is broadcast at 320, 192 and 128 kbps in MP3, Windows Media, Real Media, and Quicktime format. You may listen using iTunes, RealPlayer, Windows Media player or another MP3 player installed on your computer. For complete information on what's playing, please use our Now Playing window or the accompanying pop-up window. Become a fan of Organlive on Facebook. Thanks for visiting Organlive. If you have comments or suggestions, please feel free to contact us.